I’m in a cover band now. Turns out I can sing. Please come to our very first show at one of my very favorite venues in DC. All Her Muses featuring cover songs by Natalie E. Illum and The Grey A first full-length show will be The Fridge on JULY 9 with special musical guest Nancy Eddy (of the Pushovers). Doors 7:30pm. $10. We are all so excited to sing for you. Grey and Natalie met in mid 2014 and immediately found a wealth of common music loves between them and a mutual talent. They quickly discovered there was a special blending their voices could achieve and All Her Muses was quickly built. 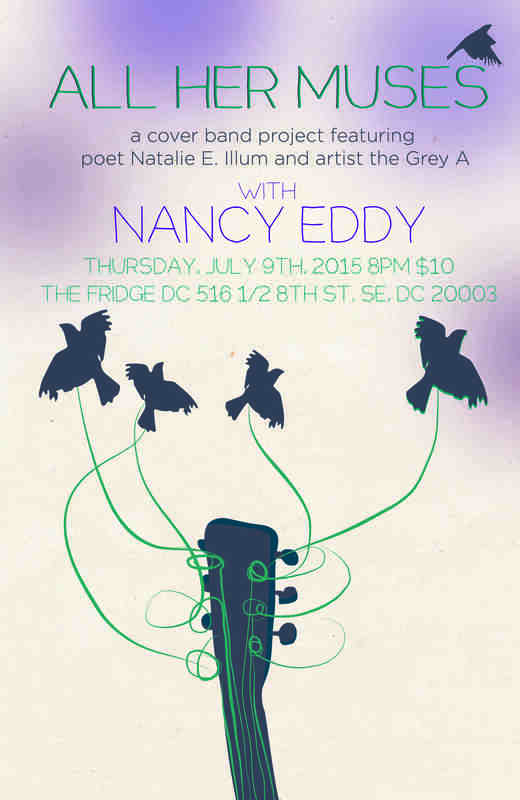 Their first performance on July 9th at The Fridge DC is not to be missed and has been months in the crafting. Be sure and reserve your tickets today. Natalie E. Illum is a performance poet, disability activist and storyteller living in Washington, DC. She is a founded board member of the mothertongue poetry series, a DC women’s open mic that lasted 15 years. Her work has appeared the anthologies Word Warriors: 35 Women of the Spokenword Revolution; Full Moon on K Street; and the upcoming Write Bloody collection We Will Be Shelter. Her stories have appeared in Feminist Studies and on NPR’s Snap Judgment. She has competed on the National Poetry Slam circuit since 2008, and is the 2013 Beltway Grand Slam Champion. Natalie has toured with many national artists, including Michelle Tea, Eileen Myles, Buddy Wakefield and Andrea Gibson. Her writing centers around disability, identity and autobiography. She recently started a position as a guest blogger with the Huffington Post. She has an MFA in creative writing from American University, and teaches workshops in a variety of venues. Grey is a songwriter and artist who’s journey has lead from Dallas, Texas to Nashville, TN. He studied music at James Madison University and graduated from Middle Tennessee State, moving into Washington, DC early 2009.